Most English nouns form their plural by adding either -s (books, bands, bells) or -es (boxes, bunches, batches). These plural forms are said to follow a regular pattern. There are no easy rules, unfortunately, for irregular plurals in English. They simply have to be learnt and remembered. But not all nouns conform to this standard pattern. In fact, some of the most common English nouns have irregular plural forms—such as woman/women and child/children. In addition, several nouns have alternative plurals, one regular and the other irregular. People have to learn which form to use as they meet the words for the first time, and must become aware of variations in usage. When there is a choice, the classical [irregular] plural is usually the more technical, learned, or formal, as in the case of formulas vs. formulae or curriculums vs. curricula. Sometimes, alternative plurals have even developed different senses, as in the cases of (spirit) mediums vs. (mass) media, or appendixes (in bodies or books) vs. appendices (only in books). As you'll see in the list that follows, many words with irregular plurals are loanwords that have kept their foreign plural forms (or at least held on to those forms as alternatives to regular English plurals). In the list below, you'll find singular noun forms in the left column and the corresponding plural forms in the right column. 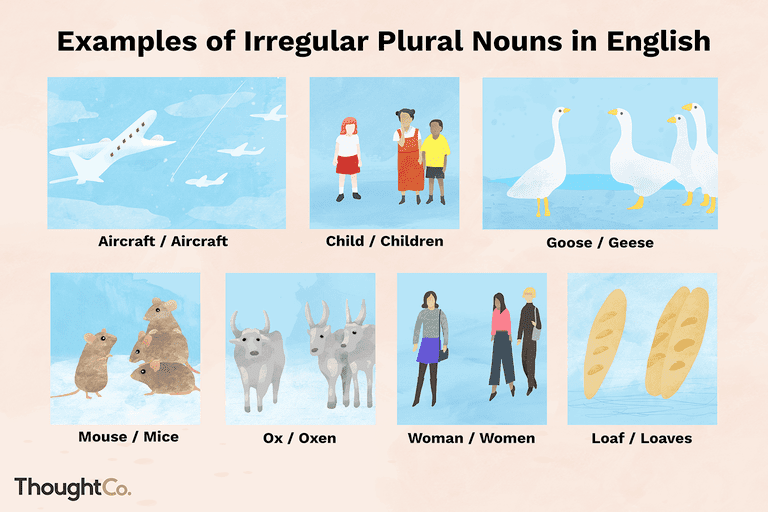 When a noun has more than one plural form, the irregular one appears first, though that doesn't necessarily mean that the irregular form is more widely accepted than the regular form. The plural forms in this list are recognized by Merriam-Webster's Collegiate Dictionary (2003) and The American Heritage Dictionary of the English Language (2011). What Are Count Nouns in English Grammar?